Location, Location, Location! 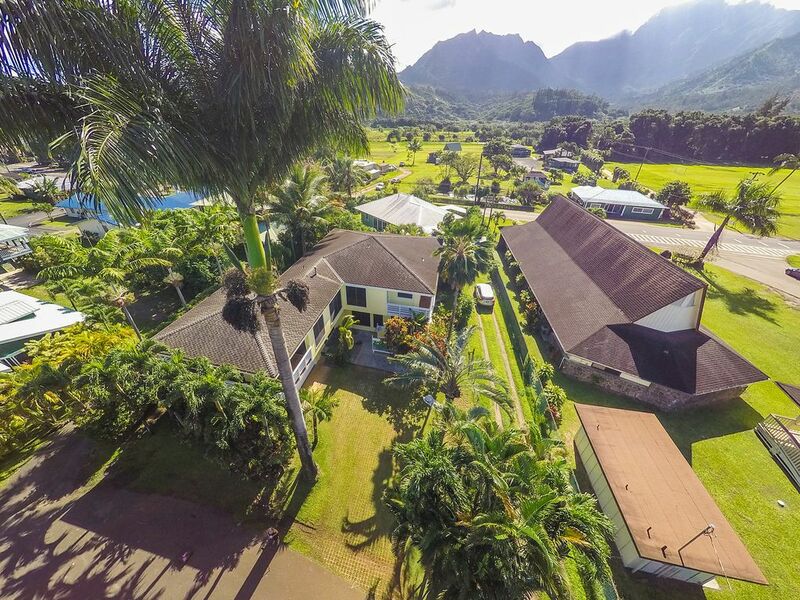 This spacious 3,000 sq ft home located less than a 5 minute walk to the spectacular Hanalei Bay has 5 bedrooms and 4.5 bathrooms. This home provides plenty of room for everyone! This spacious home is perfect for multiple families travelling together. There are 2 levels within the house joined by a central hall and stairway. The mountainside and ocean-side suites are located on the upper level. Both suites are generous with king-sized beds and their own dedicated bathrooms suites. The mountain-side suite boats a large jetted soaking tub. They each have private access to a lanai. The lower level has 3 bedrooms, two full bathrooms and a separate living room area. This living space has a wet bar, as well as large flat screen tv. There is also foos-ball table for a post-beach competition. All rooms have distinct and different decor, fun to be in and around. With new bamboo floors and upgrades throughout, you will not be disappointed. A fully equipped kitchen on the upper level, you will find everything you need, including a gas grill, to prepare a tropical feast. There are also two dining areas, one indoor and one out, to create the perfect outdoor setting for a family dinner or a romantic dining experience for 2. We have a great grassy area in the side yard, as well as a large driveway with excellent vies of the mountain. There are many great spaces to lie and rest in the shade, under a palm tree. The house is also equipped with an outdoor hot water shower for your convenience when returning from the beach. The home comes equipped with beach towels, a beach closet with beach chairs, toys, umbrellas and usually a boogie board or two. Wireless internet services and free long distance services within the United States is also complimentary. The house is two blocks from Hanalei Town and a block and a half from the Pine Trees beach access on beautiful Hanalei Bay. You can't beat Hanalei Bay with its relatively flat, hard sand that seems to stretch into the warm Pacific Ocean for miles, this beach is great for all ages including surfing for the beginner as well as the experienced surfer depending on where you surf in the bay. Only a quick walk as well from the center of Hanalei Town if you need to find the unusual gift or just pick up a few great postcards! Small shops and boutiques line the historical Hanalei Town streets and there are lots of great restaurants. Sophisticated and formal as well as the traditional Hawaiian mixed plate - and all within walking distance! Hanalei Town has an old Hawaii feel and really laid back vibe. Within Hanalei there are no hotels, condominiums, or other signs of big resort development. We would argue that Hanalei is the absolute best beach town in all the islands and that is why we chose this area as our Hawaiian beach get away. From our home you can walk out the door for a sunrise surf followed by a large cup of Kona Coffee and perhaps a visit to the farmers market for the most incredible produce and baked goods. There is a great variety of restaurants, boutiques and the natural beauty is overwhelming. Come see for yourself and we think you will agree. The location of the home is on a quiet cul-de-sac with no traffic and easy walking distance to both stunning Hanalei Bay and Hanalei Town. This location provides a huge convenience when traveling with young children and/or other families coming and going throughout the day. Additionally, the layout of the house is fantastic for families and/or friends traveling together. There are two generous master suites on the upstairs level with their own bathrooms and then on the garden level there are three more bedrooms and two full bathrooms. There are two living rooms divided between the garden level and the upstairs which provide places for privacy and also spaces for everyone to be together at one time. The views of the mountains and waterfalls are stunning from nearly every room and lanai in the house. and awesome views of the waterfalls! New 400 threadcount linens provided, as well as beach towels for all! We purchased all new bath towels in May of 2018. There is a garage but not for the guests use. There are two spacious living rooms located on the garden level and upstairs. There is a large kitchen with everything you need! There are 4 televisions in the property, two large flat screens in each living space. We offer 3 iPod speaker/docking stations throughout the home. Deep Soaking Tub in Master Bath. We also offer beach towels, beach chairs, and beach accessories. Great time and great space! We enjoyed our stay and great location! Thanks for everything! We loved our stay here. The house is perfect for a group of 10 and is an easy walk to the beach and town. They have everything you need from chairs, to towels, to boogie boards. There is a lovely view of the mountains and every room has open windows to let in the Hawaiian breeze. Thank you for taking time to review our property. We work hard to provide updated amenities to our guests. We hope that we will have the opportunity to work with you again in the future. We had such a great time at the Hale Hanalei. We were a group of 7 and the layout was perfect where everyone had enough space and enough bathrooms as well as comfortable common areas! The house is beautiful and has everything you need for a comfortable stay, including cooking at home. We really appreciated all of the available beach gear. The location is perfect - quick walk down to the bay and also into town. It is also right down the street from the amazing Farmer's market on Saturdays. Communication with Jennifer and Jack was super easy and check in was a breeze. We would definitely recommend and are already looking forward to our next trip back! Large comfortable beach house near beach and town. My family of 7 adults thoroughly enjoyed this beach house in Hanalei over the Christmas holiday. Loads of room for everyone, nice kitchen, dining area, and living room (not to mention a great rec room). They also had 'loads' of beach accessories (towels, boogie boards, chairs, umbrellas etc...). Would definitely stay here again. Very impressed with how clean this home was. It was a very comfortable stay. So fun to be able to walk to both town and the beach. Our home is located on a quiet cul-de-sac, 1.5 blocks from beautiful Hanalei Bay and 2 blocks from Hanalei Town. Very easy and convenient walking distance to the beach and/or the restaurants and shops of Hanalei Town.